﻿ General Info > What Can AssetManage Do? AssetManage is designed to provide a complete asset tracking solution for virtually any business. AssetManage is currently being used by thousands of companies and organizations to keep track of assets such as: Tools, Computer Equipment, Rental Property, Police Car Equipment, Office Furniture, Museum Artifacts and many more types of property. •Multi-User capable. More than one user can make changes to the same data simultaneously. Just place the AssetManage data file in a central location on your network. •Barcodes. Scan & Print barcodes to attach to your assets. •Attach up to 16 pictures to each of your records by scanning, pasting or importing them. •Attach files and links to your records. Click on the attachment link to visit the specified website address or launch the attached file. •Show a live video feed from your Webcam and take pictures of your assets. •Check when service agreements and warranties expire on catalogued items. •User Permissions. Assign permissions to users such as whether they can delete items, backup data and much more. •Track repairs, maintenance costs and other expenses related to an item. •Check In / Out to keep track of tools and other equipment. •The integrated Report Designer lets you create Reports, Labels & File Cards. •Track changes in an item's location or status. •Calculate both Monthly & Annual depreciation schedules. 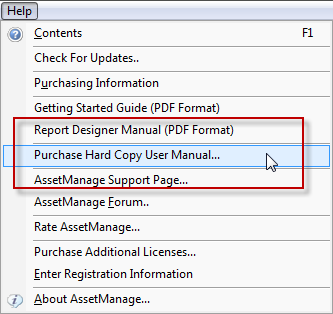 To purchase spiral-bound printed copies of this manual, select Purchase Hard Copy User Manual... from the main menu.